stl poker sat down recently with 2004 world champion greg “fossilman” raymer for a player interview. the 46 year-old poker legend is a poker stars team member. greg raymer (and the non-profit organization poker players alliance) has also championed the cause for the regulation and legalization of online poker. on july 28, the house financial services committee passed the internet gambling regulation, consumer protection and enforcement act by a 41-22-1 vote. Greg is here today to tell us more about the fight — for the right to play poker. In 1995, the Missouri Athletic Club purchased the former Town and Country Racquet Club. Two Nice Guys pizza remains open on Manchester. Greg inquired, he heard they closed. Tell us about your college days and counting cards at the blackjack tables. 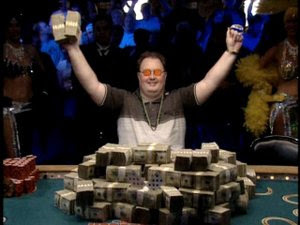 Greg Raymer won $5 million dollars at the 2004 World Series of Poker Main Event. How was your poker career going before you won the Main Event? “My relationship with Poker Stars has always been very special to me”. Tell us more about the fight to regulate and legalize online poker. What can players expect from the Poker Stars North American Poker Tour (NAPT)? Tell us about your 2010 WSOP and the Tournament of Champions format. “Sometimes you play a hand great — and you still lose”. Are you friends with Saint Louisan Dennis Phillips? Greg Raymer would have the last say, and bust Mike Matusow late in the 2004 Main Event. What kind of relationship have you had with Matusow since 2004? What poker player do you admire the most and why?